Pixel 3 vs iPhone XS, Galaxy Note 9: which camera takes better portrait photos? Whether you see Portrait Mode as a gimmick or as a valuable artistic tool, its popularity is hard to ignore. To customers, it is a new and exciting way to make people stand out and shine in their images. To phone makers, it is another feature highlighting the photographic and computational abilities of their devices. And to us – well, it is a priceless opportunity for a camera comparison! The Google Pixel 3, the iPhone XS, and the Samsung Galaxy Note 9 – these are the phones running in the race. And it is a race that seems unfair in a way. After all, the iPhone and the Note 9 rely on two cameras to achieve the desired bokeh effect, while the Pixel has just one camera to work with. But in actuality, the Pixel's portrait shots are well worthy of competing, sprinkled with a healthy dose of AI magic. But are they any better? Time to find out. Out of all the photos we took for the needs of our comparison, this scene is my second favorite. Clearly, using Portrait Mode is a surefire way to make reading Tolkien's work in a library look epic! Picking the best shot, however, is a bit tricky and greatly depends on one's personal preferences. The Galaxy Note 9 produced the brightest, most attention-grabbing photo, but detail in my face is strangely missing. The iPhone delivers pretty colors and a very realistic bokeh effect, but if you look closely, you'll see that it did a poorer job of separating the subject from the background. And the image out of the Pixel has plenty of detail, as well as the most pronounced bokeh. But the blurring effect here is also the least realistic. By "less realistic" we mean that if we take the same shot with a proper camera, areas equally distant as the subject wouldn't have been blurry – yet they are here with the Pixel, giving the image a slightly photoshopped appearance. My colleague Victor agreed to help me out by posing for a set of Portrait shots, and the result is the top-quality Instagram material you see here. After looking at the three images side by side, he said that the Note 9's image was his favorite, and I can easily see why: colors are vivid, his persona is brightly exposed, and the background blur is precisely applied. In contrast, the Pixel 3's portrait shot looks dull and uninspiring. Dialing up the exposure just a bit would have probably produced a prettier picture. Though there's no denying that the bokeh effect has been applied masterfully by the Pixel 3. As for the iPhone's portrait photo, it looks overprocessed and artificial, and we can't say we're big fans of this type of look. This particular shot is suitable for a "Caption this" contest, don't you agree? And as a Portrait Mode photo, the scene is probably the trickiest of them all – both because of the busy background and because of the objects in front of the subject. Hardly a surprise, object separation is glitchy on all three photos, but we can't be too harsh on any camera in this situation given how difficult it would be for any software to tell one leaf or branch from the other, let alone figure out which one's closer to the camera and how much. What matters is that our handsome model is in focus on all three images, and a viewer does not zoom in too much – as would be the case if you post one of these on social media – the imperfect blur application wouldn't be ruining the scene. Here's another case where picking the "best" photo would be greatly dictated by the viewer's subjective opinion. We have the Pixel 3 and its shot made overly dramatic by cranking up the contrast dial. Its a rather striking look – and one that many may be drawn by. The photo from the iPhone, on the other hand, looks "flat" because it has very little contrast. The Galaxy Note 9 keeps things a lot more neutral and more balanced, and the result is an overly pleasing photo. The only glaring issue is the overexposed sky in the back. We're now entering low-light territory, switching the Portrait game difficulty to "hard" for all three cameras. Impressively, the Pixel 3 and the iPhone both managed to deliver pretty good images, with only slight differences in color between the two. The Note 9 is a step behind, primarily because of the lack of detail in my face, but also because of the blown-out highlights in the background. This one's an easy victory for the Pixel 3. Not only is the bokeh effect applied with great accuracy, but the whole image is packed with detail and properly exposed. This may have something to do with the fact that the phone uses its main camera for its portrait shots, while the Note 9 and the iPhone rely on telephoto cameras which use smaller sensors and are less sensitive to light. And sure enough, if you examine the images out of the Note and the iPhone, you'll see right away how fine detail is practically missing. Still, we must admit that the "bubbles" in the background, made by the out-of-focus fairy lights, look a lot prettier and realistic. Much of what we said about the previous set of photos applies here in the final round. Again, the Pixel 3 produced the clearest, most detailed image, with the face of the subject pleasantly illuminated. The photo from the iPhone looks darker in comparison and is less flattering as a whole because of this, while the Note 9 lets much of the blue light in the upper corner bleed far into the frame, thus spoiling the image. But seriously, Google has to teach the Pixel's AI algorithms how to make proper bokeh bubbles. First of all, we have to say that we're impressed by the quality of the portraits the Pixel 3 snaps with just a single camera. It is a step ahead of the iPhone and the Note 9 with its remarkably accurate object separation, sharp detail, and outstanding low-light performance. But there's still room for improvement. 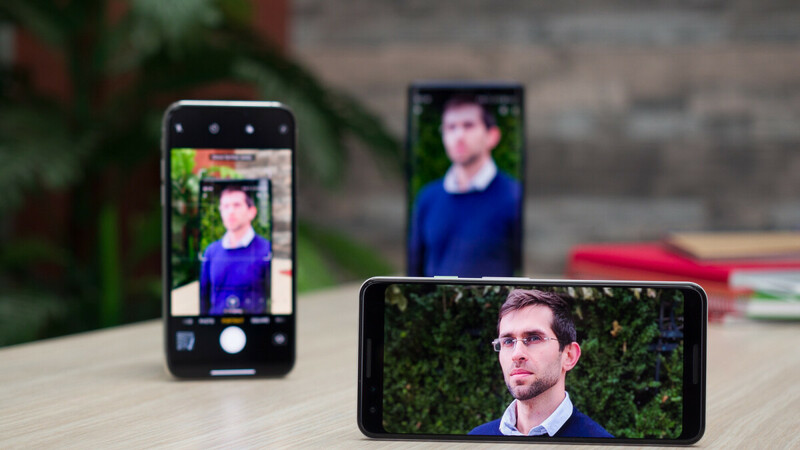 Most notably, the background blur produced by the Pixel 3 tends to be more artificial, while the Note 9 and the iPhone XS apply a bokeh effect more similar to what a dedicated camera could produce with the proper lens on. Another factor holding the Pixel back is its fixed focal length. The iPhone and the Note 9 use their dedicated telephoto cameras instead of their main ones when taking portraits. These cameras are more suitable for the purpose by bringing the subject closer – with their 2x optical zoom – and having less distortion caused by the curvature of the lenses. It's a subtle difference, but it is most definitely there. On the other hand, telephoto cameras struggle at night, as we clearly saw in scenes 6 and 7. Ultimately, we wouldn't call any of these three phones an excellent Portrait Mode performer, but they're all well-versed in the art of bokeh. And if you choose the Pixel 3 over the iPhone or the Note 9, rest assured that you won't be disappointed. IPhone definately, Pixel photos look like those are Photoshopped, subject and background just doesn't belong together, it looks like edited fake photo. But well that's exactly what it is and shows the problem having only one cam. About Note camera there's not much to say except, what is Samsung thinking and what happened to their camera quality? Nothing happened, iPhone Arena just took bad shots. I always get better shots than these. I have also seen why better photos then what PA take with the note 9. Don't know what you guys are talking about, it's right along what your would expect. The pixel won outright as even the authors admitted. The iPhone and Note were neck in neck with the iPhone failing contrast and Samsung over doing the face smudging beauty mode as usual. Both of the latter also have the bubble problem. Everyone including Phonearena left off on specic thing when it comes to portrait mode for the Pixel 3's. They have a wide angle portrait mode as well. Which none of the others offer. Hands down the Pixel 3's win. There is no contest because the 3's win, but Phonearena made it a contest. "with the iPhone failing contrast" contrast is very natural with iPhone, wouldn't say it's failing. That's how the reality looks. If you want more contrast you can add it later for your own taste. With pixel there's way too much contrast and photos looks like heavily edited photos, but again this is just matter of taste. Hey, buddy, we are all looking for ya on the bent iPad article! “It’s not a manufacturing defect”. 14 days to return it, dingbat. After that, you’re SOL. It seems your experience is the opposite of mine. Samsung service has always been superb across their product range. Apples, on the other hand, is awful. Always arguing the fault is yours and even if you do get through their avoidance tactics, it takes a month or two to get a replacement and that is usually a second-hand product. Are you really surprised that PhoneArena made iPhone look good? sorry guys, but did you smudged the note 9 camera on purpose? all the photos taken by then 9 look like trash and the reality says otherwise. They did something, I always get better shots than they have come up with and I am not a pro by any description. Well, they ARE pretty trash compared to Pixel or iPhone when it comes to Portrait Mode. Loads of blown up highlights in many scenes thanks to the lack of always-on HDR, it seriously needs some work. Yeah, of course, let me explain what we do in detail. First, we take lard. Good old lard. Yes, I know this sounds strange, but that's our secret so bear with us. We put it in a tiny mason jar that you can easily carry with you in your jacket. Anytime we take a picture with the Samsung Galaxy Note 9 we open the jar and spread lard generously over the camera. It's a little gross, but you know, we are stubborn like this and we apply this every single time we take a picture with the Note 9. That's how we get the softer detail. For the Pixel, we have a different technique. In order to get a different effect we use breaking fluid. For this one you need gloves. We put it in a small container and just dip the Pixel's camera every time we take a picture. And that's how they all come out underexposed. Of course, for the iPhone we use a pristine clean cloth every time with a special Carl Zeiss fluid to meticulously clean the lens and we also jailbreak the phone and turn on the secret super camera mode. And that's how the iPhone always wins. You are welcome! Thats rich! One of the biggest trolls on here complaining about trolls. I've seen it all now. "Breaking" fluid. I know journalism is dead, and you're... uh... pretty poor writers who cannot construct grammatically correct sentences, but can you at least learn homophones? It's brake. Brakes stop your car and use brake fluid. Fun fact: brake fluid is a yellowish to brownish color, so your "snappy comeback" doesn't even make sense. And what are you exactly trying to prove here? Pixel freakin XL.Pixel is the PORTRAIT king. Pixel all the way. Then XS. I feel bad for Samsung's portrait mode. Somebody please install Google Camera on that beach so it can shine. Have to agree Pixel kicks azz and apple and Samsung needs to take lessons from them. Totally agree. Pixel is the king of photography, nightshot and portrait. Before making photos, please clean the lens. Note 9 it's not so bad as you want to "tell" us.